Is this the best Buggy location in the world…? Take a ride across the Alvord Desert. uncut and stripped down, just you and the Playa! The Alvord Desert is around 84 square miles of dry lake bed. our trip across was across the width, I’m afraid the length would take all day to cross. our line was a slight c shape as we got a little off course. 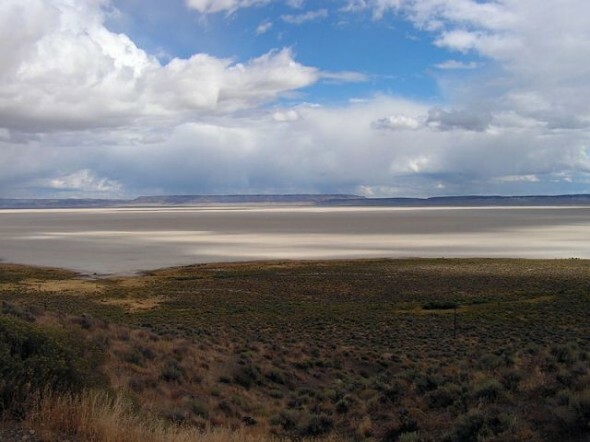 The Alvord Desert is a desert located in Harney County, in southeastern Oregon in the western United States. It is roughly southeast of Steens Mountain. The Alvord Desert is a 12-by-7-mile (84 Square Miles) (19 by 11 km) dry lake bed and averages 7 inches (180 mm) of rain a year. Two mountain ranges separate it from the Pacific Ocean—the Coast Range, and the Cascade Mountains. Along with Steens Mountain, these topographical features create a rain shadow. This entry was posted on Wednesday, September 26th, 2012 at 4:36 pm. It is filed under Alvord Dry Lake, Information, Video of the Week and tagged with Alvord Dry Lakbed, Mike Kenley. You can follow any responses to this entry through the RSS 2.0 feed.